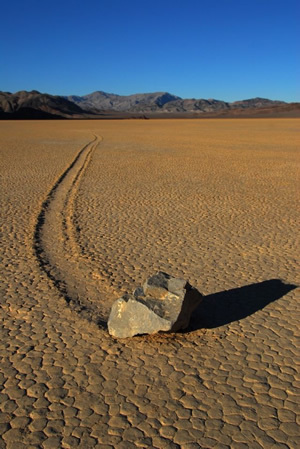 Are spirits of the Racetrack Playa, a dry river bed in the Death Valley CA, moving 300kg rocks about? No one has seen the “Sailing Stones” move or knows how they move – at least there is no scientific consensus – but most seem to think that a combination of wind, rain and ice is behind the spooky movement that occurs only once every two years or so. Some of the tracks show the rocks moving in straight lines; others bend about and some even do 90 degree turns.